To turn this backyard in Maple, Ont., into a high-energy tropical retreat-like entertainment hub this homeowner was looking for, The Pool Craft Company in Richmond Hill, Ont., had to start with a blank slate. 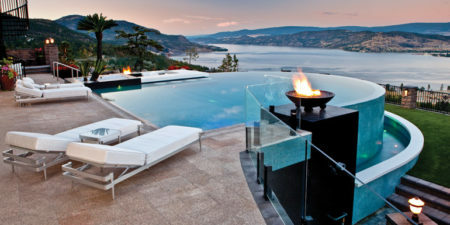 Valley Pool & Spa created an impressive multi-level oasis for this homeowner in Kelowna, B.C., in working with the challenges of a backyard that was essentially a steep, sloped cliff. Due to the nature of this project, it took three years to complete as the unique limitations of the yard demanded several creative ideas. 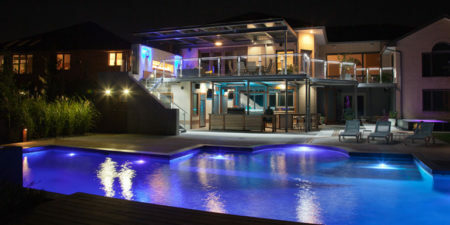 To provide this upper mid-town Toronto homeowner with all of the luxuries of modern living, without forgoing the convenience of their central urban location, Betz Pools Ltd., of Stouffville, Ont., designed and built this project by starting from the house and working outwards. This project’s use of clean lines and various uncluttered, efficient spaces effectively mimics the contemporary style and theme of the interior and exterior of this residence in Arva, Ont. 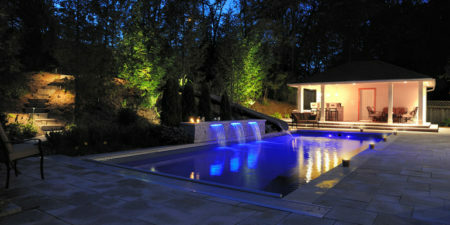 Managed by Artistic Shadows Landscaping/Pools, also of Arva, the job called for the installation of a 15.2- x 4.2-m (50- x 14-ft) custom-concrete pool with waterfall spillways, an overflow spa, fireplace, privacy screens, decking and patio areas, change/bathroom facilities, outdoor kitchen, and lawn space. This split-level lot in Burnaby, B.C., which has a gentle, southwest slope, naturally lent itself to a vanishing-edge pool design. With this in mind, Alka Pool Construction Ltd., also of Burnaby, installed a 3.6- x 9.7-m (12- x 32-ft) pool, complete with a 9-m (30-ft) angular vanishing edge, which nearly spans the entire length of the pool and allows water to cascade approximately 0.6 m (2 ft) into a lower catch basin. This Burlington, Ont., homeowner was looking to create a backyard environment that would lend itself to entertaining. 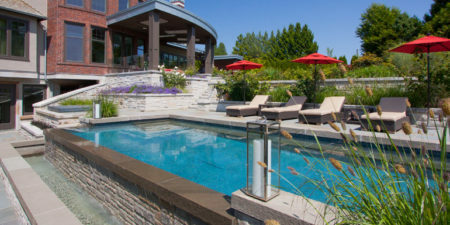 Despite the yard being somewhat limited in size, they turned to Burlington-based Oasis Pools Ltd., to incorporate several features to create a balanced outdoor oasis. Immediately it was determined that a full-size swimming pool would dominate the yard; therefore, a 3- x 5.2-m (10- x 17-ft) hybrid saltwater pool/spa combination was installed using gunite concrete.